Welcome to the November edition of the Virtual Book Club for Kids. The second Monday of every month is the Virtual Book Club for Kids. I love participating with other kid bloggers to bring you the best of children's literature. Each month we choose one author, announce it at the beginning of the month, and then share our ideas on book club Monday. Everyone is invited to participate. If you have a blog, feel free to link up your ideas below. If you don't have a blog, you can still participate. Share your ideas in the comments or on my facebook page. Plus, everyone is encouraged to check out the links that are shared. I always find tons of amazing ideas for my own kids in the VBC. This month we are exploring books by Karma Wilson. The boys and I decided to read "Bear Says Thanks" by Karma Wilson. This was a great choice for this season of Thanksgiving! We also did a lot of work with homophones while reading this book. Scroll down to the bottom of the post to get your own free activities that work great with this book! Bears Says Thanks by Karma Wilson In this book in the Bear series, Bear has nothing to share with his friends. Each of his forest friends deliver yummy treats to share. Bear feels sad because his cupboards are bare. In the end, he learns he does have something valuable, although intangible, to share. Bear says Thanks is set in a forest. It's a great opportunity to discuss the forest habitat. 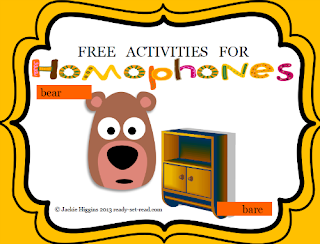 Throughout the book, readers will encounter homophones like bear and bare. (His cupboards were bare). They may also notice that the word "hare" is used instead of rabbit. This may be a new vocabulary word for some young learners. Bear Says Thanks is a great opportunity to discuss homophones. 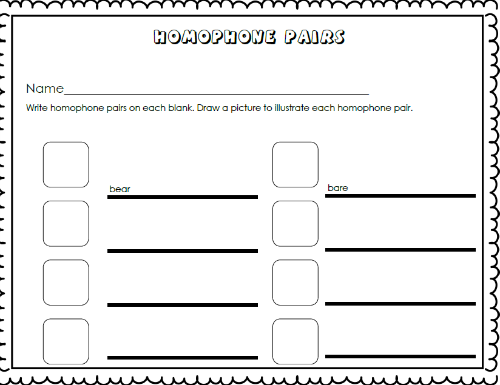 A great way to teach homophones and building vocabulary is concept sorts. 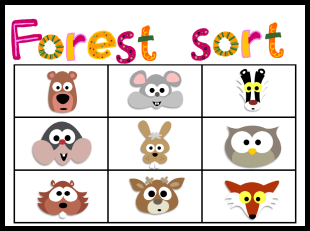 After reading the book, I had the boys sort animals by forest and non-forest animals. We were able to label words like bear and hare. 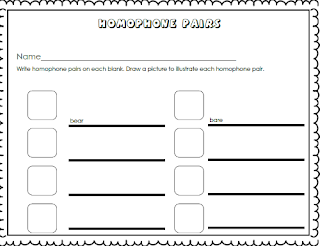 With my oldest son, we were able to discuss the homophones bear/bare and hare/ hair. With older readers, you can challenge them to write lists of common homophones-- words that sound the same but are spelled differently. I've always taught this concept by telling students about my mom and her sister. They sound exactly the same on the phone, but when you see them, they don't look the same. Homophones sound the same, but don't look the same. Children can also create simple illustrations of the words for future reference. Children can write and illustrate their intangible items in a story. I've created free printables to use with these activities. You can download them from my teachers pay teacher store. While you are there, you might also want to check out my other early literacy resources. You can also find me busily pinning on Pinterest, tweeting on twitter, and chatting about the best Children’s literature on facebook and Google+. Do you have ideas to link up to the book club? Now it is your chance to share your ideas. Here are the rules for linking up. Link up only posts inspired by Karma Wilson books that share children's book inspired crafts, activities, recipes, etc. Any other posts will be deleted. Visit other blog posts on the linky and comment on or share the ones you love. Very nice review. I didn't about this author. Super cute freebie! Thanks. Pinned! We were definitely on the same page with this one! Great post!! !